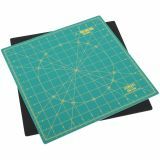 OLFA Spinning Rotary Mat - OLFA-The two-piece mat has a non-slip stationary bottom layer and an interlocking green top rotary mat with yellow grid lines and markings which rotates 360 degrees smoothly on the stationary base. Simply rotate your work on the mat to keep your cutting angle directly in front of you. Perfect size to take to class where you may not have a lot of room. Cutting surface measures 12x12 inches. Imported.